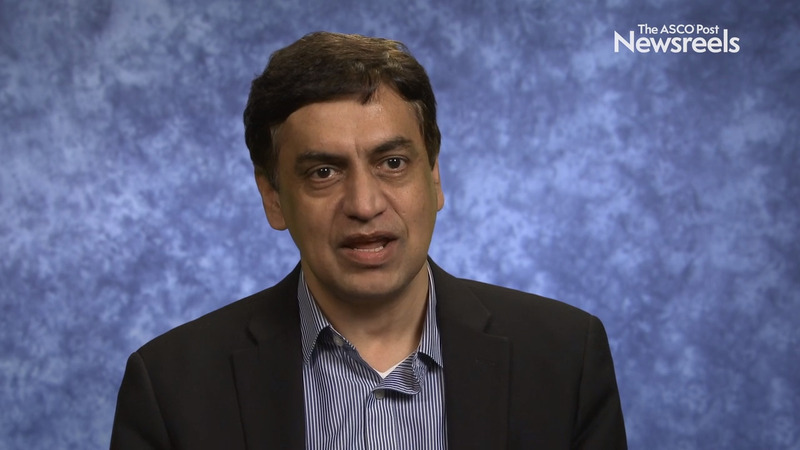 Madhav V. Dhodapkar, MBBS, of Emory University, summarizes a session he co-chaired on emerging approaches for vaccines, personalized/neoantigen vaccines, and mutation-targeted immunotherapy for diffuse midline gliomas. Philip J. Bierman, MD, of the University of Nebraska Medical Center, discusses how to identify and treat the 1% to 2% of patients with diffuse large B-cell lymphoma who have central nervous system involvement as well as systemic sites at the time of diagnosis. Julie R. Park, MD, of Seattle Children’s Hospital, discusses findings from this phase III trial of tandem myeloablative autologous stem cell transplant using peripheral blood stem cell as consolidation therapy for high-risk neuroblastoma (Abstract LBA3). James R. Perry, MD, of Sunnybrook Health Sciences Centre, discusses findings of a phase III trial of short-course radiotherapy with or without concomitant and adjuvant temozolomide in older patients with this tumor (Abstract LBA2). Martin J. Van Den Bent, MD, PhD, of the Daniel den Hoed Cancer Center, discusses the interim analysis of the EORTC phase III study on concurrent and adjuvant temozolomide in anaplastic glioma without 1p/19q co-deletion (Abstract LBA2000). Louis Burt Nabors, MD, of the University of Alabama at Birmingham Comprehensive Cancer Center, discusses improvements in the 2016 NCCN Guidelines for glioma, anaplastic oligodendroglioma, and glioblastoma. Gregory T. Armstrong, MD, MSCE, of St. Jude Children's Research Hospital, discusses the findings of a landmark survivorship study (Abstract LBA2). Jan C. Buckner, MD, of the Mayo Clinic discusses adjuvant whole-brain radiotherapy and the need for initial treatment with radiosurgery and close monitoring to preserve cognitive function in patients with brain metastases (Abstract LBA4). Anita Mahajan, MD, of MD Anderson Cancer Center, summarizes results from three clinical trials on radiation therapy for ependymoma, locally advanced thoracic esophageal squamous cell carcinoma, and meningioma (Abstracts 31, 1, 7).